I cannot dance. Oh, I tried to fake it when I was younger, but I don't think anyone was fooled. I'm not sure what was missing that caused my less-than-coordinated movements. Some algorithm that other people have, perhaps. However, if I live long enough to be instantiated into another body, I will make sure it (and I) can dance. If robots are to be accepted by humans, they will need to be able to engage in conversation in the same way, moving and gesturing along with us. 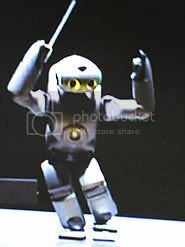 Robots have already been developed who can dance and even conduct an orchestra (click here to read the article and here to watch video). But the difference is that these robots have been entirely pre-programmed. The little squishy robot called Keepon, in contrast, is designed to move in response to what it hears and sees. Click here to watch Keepon orient himself to movement and voices. As reverse-engineering the human brain progresses, the hardware and augmentation software is also progressing, so that your consciousness may one day soon be able to be instantiated into a better body. Hopefully you will be able to dance.